Motorino will always have a fond place in my heart. The original Williamsburg location was the home of many dates, an eye-opener in terms of pizza for me, and one of the reasons I moved to Brooklyn. Then the Brooklyn location closed and anyone who wanted to enjoy their Neapolitans had to trek to the East Village to squeeze into a crowded restaurant. Or they could just go for their weekday lunch special!! 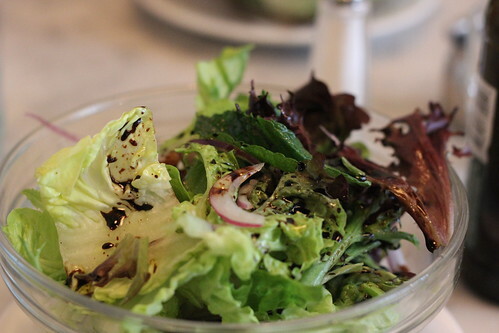 $12 for beyond delicious pizza and a salad? Sold. I'd heard rumors of this lunch special, so when a friend asked for a lunch date last week, I said "Motorino." 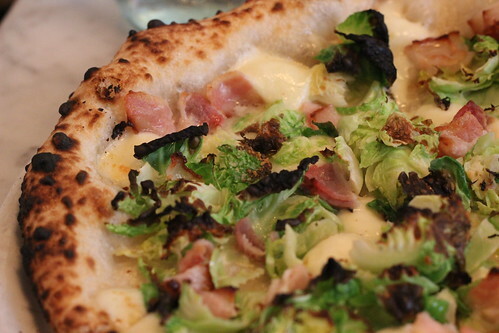 It helps that the special includes one of my favorite pizzas of all time, the Brussels Sprout with pancetta. Perfectly roasted slices of sprouts with diced meaty porcine goodness in every bite. I die every time. You can also get the Marinara, Margarita, or Soppressata Picante. With all those summer Fridays coming up--and those *cough* *cough* sick days when it just so happens to be gorgeous out--I'm sure I'll see a few of you there. Wow, $12 IS a really good deal! Definitely gonna check this out. Thanks!